I picked up a new group gift from Mynerva recently; it has quite a beautifully serene look to it. It comes with two makeup options, but both are quite delicate and subtle. Quite a nice change from heavy-laden makeup I think – however I can always add some tattoo layers for a more defined look. I’m very fond of this dress, even though it is not mesh. Being an all out fan of all things mesh, I do sometimes still find quality sculpted clothing. The dress I am wearing is from Chantkare, and has a purity of style about it with sculpted skirt. I’m not sure if this would translate well into mesh though, and I love the tied sleeves at the wrists as well. The dress is a comfy length without creeping high up the thighs. I’m a bit over micro minis – they seem to me to lack elegance and realism. This dress sweeps slightly above the knees, keeping with the theme of serenity. 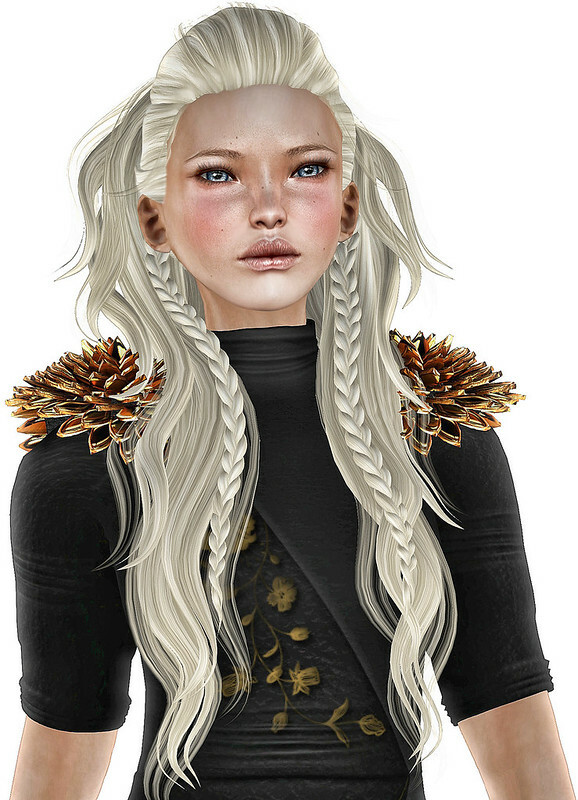 I’ve added the new Abbey hair from Elikatira, which is just so gorgeous and gentle in its design. Truly one of the best mesh hair I have seen thus far, but I should not be surprised considering it’s designer! I’ve added a cute new skirt from Cold Logic, keeping with the green theme. Note the back drapery of the jersey – perfect!